Shawn Stevenson is the creator of The Model Health Show, which has been featured as the #1 Fitness and Nutrtion podcast on iTunes. A graduate of The University of Missouri - St. Louis, Stevenson studied biology and kinesiology. He later founded the Advanced Integrative Health Alliance, a company that provides wellness service for individuals and organizations worldwide. Stevenson has been a keynote speaker for numerous universities, organizations, and conferences. He lives with his family in Wildwood, MO. "The fact is, to be happy, healthy, and productive, we need to get enough sleep. 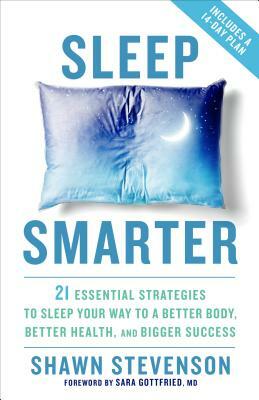 Sleep Smarter is a terrific resource for anyone who wants a great night’s rest." "If you are looking for the most comprehensive guide on enhancing your sleep, beating insomnia, and using cutting-edge, proven techniques to optimize the most important part of your body's repair and recovery, then you found it. Sleep Smarter contains everything you need to know in one convenient, succinct summary. I will definitely be recommending this book to any of my clients who want to sleep better, deeper, and of course, smarter."